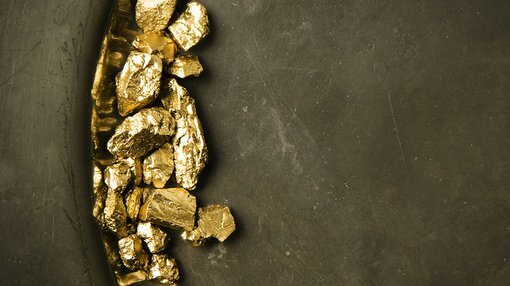 Kairos Minerals (ASX:KAI) this morning announced that it has discovered visible gold from newly identified targets at its 100%-owned Croydon Project in the Pilbara. 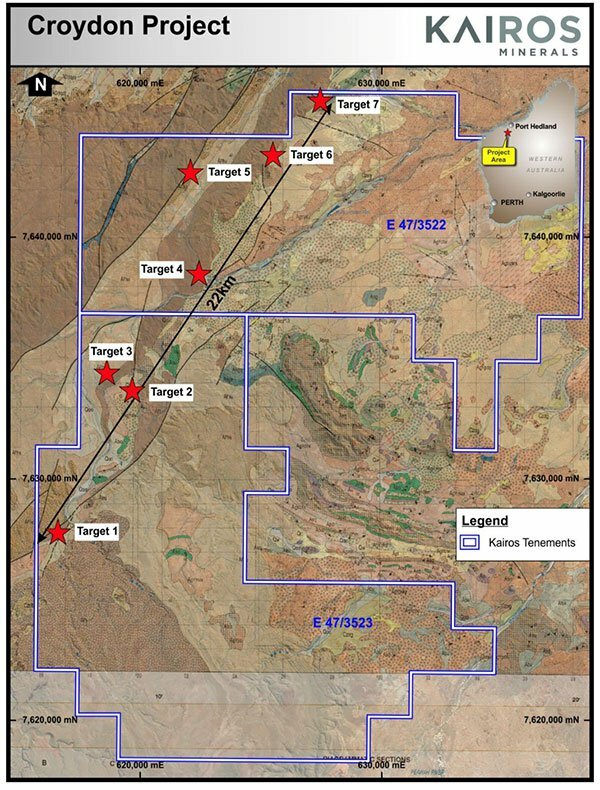 KAI identified four previously un-mapped conglomerate targets over a strike length of around 10 kilometres in a favourable stratigraphic location below the Mt Roe Basalt within the Mt Croydon Project. It successfully recovered visible gold in panned stream sediment samples from the first target to be evaluated. The company described the discovery of visible gold in panned samples from the very first target as “a very exciting early breakthrough adding to the now widespread occurrences of conglomerate-hosted gold in the Pilbara”. However it is early stages here and investors should seek professional financial advice if considering this stock for their portfolio. The field work successfully identified extensive areas of previously unrecognised prospective conglomerate units (Targets 1-4), up to ~30m in thickness at four different locations predominantly within the southern portion of tenement package. These can be seen on the below map. At Target 1, the conglomerate package has been mapped continuously over a strike length of approximately 2 kilometres. Within this target area a 10kg stream sediment sample (-2mm) was panned which returned 28 pieces of gold. KAI was able to fast-track its initial assessment of the Pilbara Gold Project and come up with multiple high-priority areas which are highly prospective for significant conglomerate-hosted gold discoveries. These discoveries resulted from just a few weeks of helicopter-supported reconnaissance exploration. This is particularly impressive considering the vast amount of ground that had to be covered, the inaccessibility of many of the locations and the extreme weather conditions currently being experienced in the unexplored part of the Pilbara. “After focusing on a 2km stretch of mapped conglomerates at the Croydon Project, we have been able to utilise the age-old prospector’s method of panning to identify visible gold in numerous stream sediment samples collected from creeks draining a thick sequence of conglomerate beds beneath the Mt Roe Basalt at the base of the Fortescue Group. 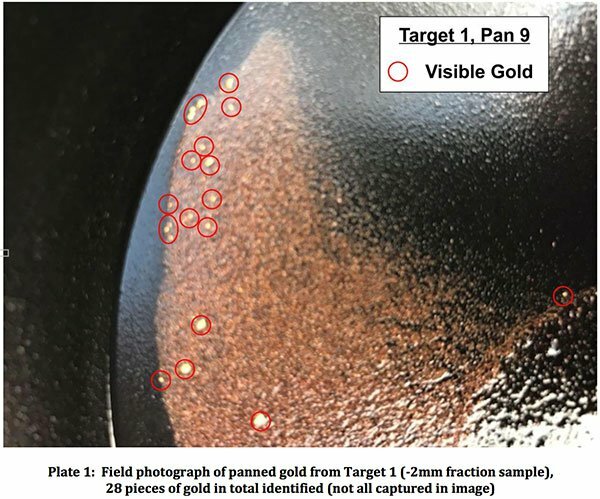 At Target 1, we have consistently been able to see gold in panned samples with up to 28 pieces identified from one 10kg sample. Over the coming two to three weeks, KAI will undertake a further phase of helicopter-supported exploration at the Croydon Project prior to the wet season. This will comprise of additional stream sediment sampling and detailed soil sampling. The results will be announced as they are received and interpreted. In addition, ground-based exploration activities are ongoing at Croydon West E47/3519 and E47/3520. These exploration activities will help prioritise areas for stream sediment sampling, trenching, metal detecting and drilling next year. Drilling is continuing at KAI’s Mt York Gold Project, which is 100 kilometres south of Port Hedland in the world-class Pilgangoora district. This program is expected to be completed this week and initial assays results over the coming weeks.